Ghost shrimp, also called glass shrimp or grass shrimp, average 1.5 inches long. You can see their insides, including the food in their stomachs, through their transparent bodies. Baby ghost shrimp, or fry, are so tiny that you cannot see them easily when they hatch. Most large aquarium fish will eat the nutritious ghost shrimp. Use a maternity tank for hatching and raising feeder ghost shrimp. A 10- gallon freshwater aquarium is a suitable maternity tank for ghost shrimp. Place a layer of gravel in the bottom of the tank. A sponge filter with a small air pump will aerate the aquarium without harming ghost shrimp fry. Ghost shrimp require water temperature of 65 to 80 degrees Fahrenheit. 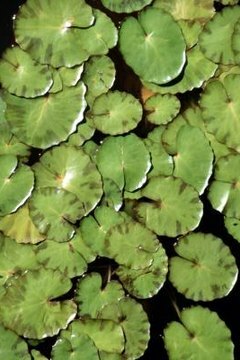 Plant lots of small-leaved and floating plants, such as anacharis, duckweed and hornwort, and put a small artificial wood log in the aquarium. Ghost shrimp fry will swim toward light and can be injured by swimming into the walls of their aquarium. Prevent this by keeping a light turned on over the aquarium 24 hours a day. Cover all sides of the tank with black construction paper to keep out ambient light. It's not difficult to distinguish female ghost shrimp from males. Female ghost shrimp are larger than males; only females have a ridge along the tops of their tails. Pregnant females have a greenish hue -- you're seeing the green eggs she's carrying, through her transparent body. Healthy ghost shrimp are active swimmers; they have no milky streaks or colorations. A ghost shrimp has several pairs of legs under the rear of her body, called swimmerets. A pregnant female carries 20 to 30 eggs attached to her swimmerets. The pinhead-size eggs hatch after about three weeks. Fry stay on their mother's swimmerets for the first week after hatching. They look like tiny mosquito larvae. Ghost shrimp fry are difficult to see until they reach 6 to 8 weeks of age. Don't vacuum the fry tank. Feed your ghost shrimp fry liquid fry food, daphnia, newborn brine shrimp and microworms every two to three hours, 24 hours a day. After the babies separate from their mom's swimmerets, remove her from the maternity tank. The fry will molt every few months. Ghost shrimp are scavengers; as they mature they can eat flake food, young snails and small fish. A natural food source for predatory fish, ghost shrimp are feeder size at 1/2-inch to 3/4-inch long. They provide essential fats and protein for live-food eating fish, such as pipefish, seadragons and seahorses. Almost all large fish find ghost shrimp to be delicious.